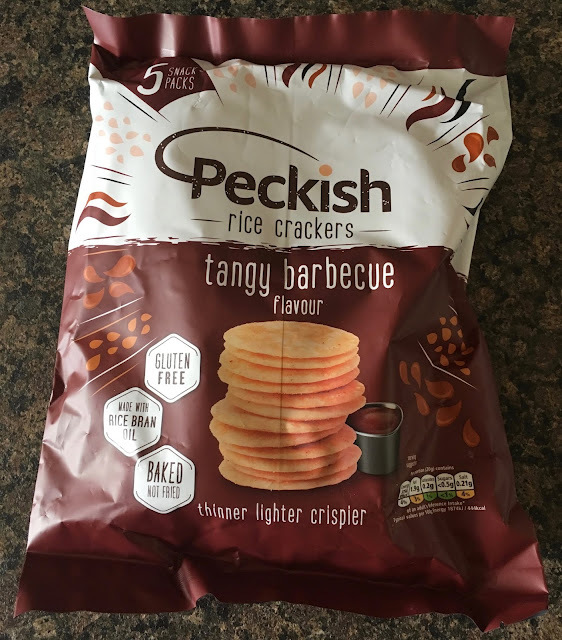 Always on the lookout for any tasty alternative snacks to crisps and peanuts, these Peckish Tangy Barbecue Rice Crackers seemed to fit my rather loose requirements. Rice Flour is used in producing Peckish crackers, which makes for a lighter crispier cracker than the usual off the shelfers (yes, I just made up a word – I’m a blogger, I can do things like that, well, maybe…). They are gluten free and are baked in rice bran oil not fried for less saturated fat. I like the serving suggestion on the front of the packet recommending the cracker muncher dip them in a barbecue sauce, although I’m slightly worried now that these Peckish Tangy Barbecue Rice Crackers are actually just a plain flavour and don’t taste of anything unless you dip them. However, that could be an idea to add the dipping sauce into the packet and just get the customer to do all the work!? Anyway, there was a strong smell of rice on opening the packet, which made me worry slightly more. The well rounded crackers had an orange tint from the seasoning which made me worry less that I’d have to go out and buy a barbecue sauce to enjoy these with. I don’t think there are any fast food joints around my work I can quickly duck into and nab a couple of free sachets. On taste these Peckish Tangy Barbecue Rice Crackers are pretty subtle though, so you could probably do with something for them to dip into. They’re quite a pleasant barbecue flavour, but not particularly ‘tangy’. The word ‘tangy’ screams sweet lip-smacking flavour to me and these crackers are too understated for that. However, I reckon they’d go well with a piece of light cheese, nothing to strong mind, and perhaps some barbecue sauce daubed on top! The 20g packet has 89 calories, with 1.9g of fat, less than 0.5g of sugar and 0.21g of salt. Please see photograph for ingredients.